Originally developed with the support of the National Theatre Studio, Matthew Wilkinson’s compelling two-hander, which is based on a true story about an air accident, and subsequent blame and revenge, is explicitly political in intent: 10% of its profits go to the Forgiveness Project, a UK charity that promotes reconciliation between victims and offenders. When Ossetian architect Nikolai Koslov loses his wife and two small children in a freak plane crash in Switzerland, he blames Thomas Olsen, the air traffic controller and, when the official channels prove unable to punish him, decides to enact his own revenge. Subsequently, he claims to have no memory of the incident and is released from prison after four years. On his return to Ossetia, Koslov is greeted as a national hero, but what about the darkness inside? Wilkinson tells this story with great pace and fascinating detail. Although based on a true case, My Eyes Went Dark has the feel of an ancient Greek tragedy. In its exploration of the feeling of rage as a form of loyalty to the dead, it shows both the agony of loss and raises a number of issues about grief, mourning and forgiveness. 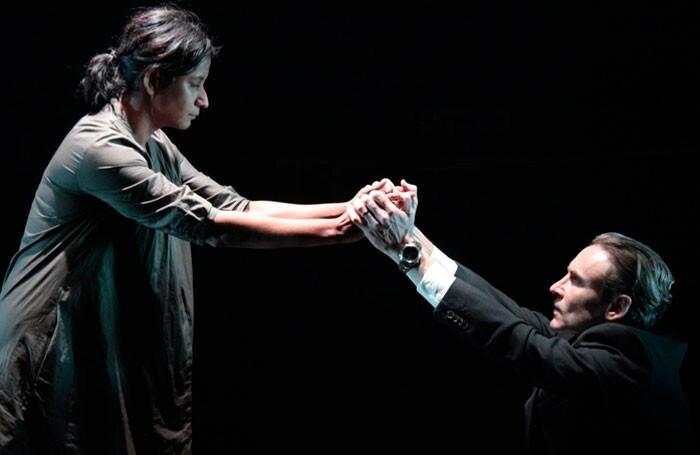 Wilkinson’s own production has a bare, dark traverse staging, with excellent performances by Cal MacAninch (Koslov) and Thusitha Jayasundera (playing a dozen other roles including Koslov’s therapist and sister-in-law). Intense, thought-provoking and intelligent, both give a very strong reading of an emotionally fraught story.